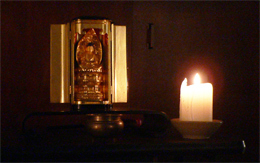 When preparing to do zazen, remember to harmonize the body, then the breath, then the mind. Sit on the forward third of your cushion. Arrange your legs in full lotus, half lotus, Burmese, seiza, bench or chair. Make sure you are comfortable! Center your spine by leaning forward and back, then swaying right and left three times. pulling you straight up. Now, relax one notch. Take three long, deep breaths. All the way in, all the way out. Now let out a long sigh then gently let the breath fall to the lower belly. Straighten your spine a little bit more with each inhalation, and relax your breath a little bit more with each exhalation. Be fully aware of each breath for its entire cycle. Count each breath on the exhalation. When you reach ‘10’, begin at ‘1’ again. If you lose count, begin at ‘1’ again. Let the mind settle in the belly along with the breath. Let all thoughts and feelings pass through the mind like the Spring breeze. When you find the mind has grasped onto a thought, gently release it and return to counting the breath. Straighten the spine a little bit more with each inhalation. Relax the mind a little bit more with each exhalation.